A rather exquisite mini series comes to an end. The Strange Adventures of HP Lovecraft has been a cut above most comic book titles, with every detail – from the distressed, pulp novel feel of the cover, to the Jung quotes and the the obvious love and knowledge of Lovecraft – meticulous. 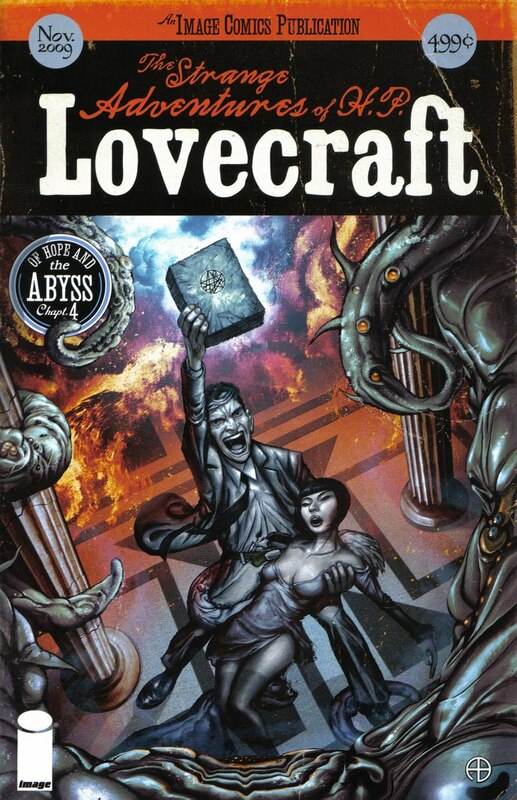 In this final part, Howard Lovecraft battles the unthinkable and unknowable horrors, while trying to rescue the (unrequited) love of his life. At the same time, the police are closing in on Lovecraft, while his ill Mother and elderly Aunts (who again put in a brilliant cameo appearance) strive to protect their son and nephew. The art is absolutely stunning, with Tony Salmons lavishing us with several splash pages that give full reign to the horror of Lovecraft-ian imagery. The story, courtesy of Mac Carter, celebrates Lovecraft’s journey from weak and fragile, self-loathing failed writer to heroic warrior, battling shocking supernatural horror and emerging as a celebrated, empowered novelist of the unimaginable. The plot rattles along as the art – all muted tones and sombre or rain sodden locations – propels the reader into the dark heart of the madness. My one criticism is that this final issue has took several months to appear (in fact, the last one was out in July) and that has detracted from the overall impact of the series. However, it will make one amazing trade when it gets collected and published (no doubt in plenty of time for the movie release). All said, in a year of some fantastic comics (Unknown Soldier, Sweet Tooth, Walking Dead, the final issues of Brubakers Daredevil) this 4 parter is right up there with the very best of 2009. A fantastic, intelligent and artistic triumph.